The new Fire Disc Cooker is changing the way I personally can cookout! where, when and how! 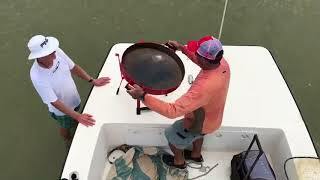 I live on the outer Banks of NC which is full of small Islands which provide great destinations for me to take my clients and family ashore for different adventures, with the Fire Dic I can brake it down store it in a compartment then break it out and be cooking within minutes. Whether it's setting it up on the boat, on the beach or camping out in a wooded camp site or lodge the fire Disc is the most versatile cooker/grill I've ever used. The Fire Disc also lets you cook large quantities of food at one time ( 10 burgers, 15 fillets of fish etc..) it's just an awesome cooker and very well constructed for years of use in the rugged out doors! One thing I'd say is that you need to season it very well before cooking, as you would a cast iron fry pan. I love to take mine on the boat with me and after catching fish we can pull up to a sand bar, fillet the fish and grill them up for quick lunch my clients will never forget! My name is Noah Michael Lynk. I am the owner/operator of Noah's Ark Fishing Charters, based out of Harkers Island, NC. My specialty is light tackle inshore/nearshore fishing for Trout, Red Fish, Flounder, Cobia, Spanish Mackerel, and all other inshore species. My love and dedication to fishing began at a young age on the shores of Molokai, Hawaii, where I lived until my early teens. Once my family moved to North Carolina, I found that the waters here provided the same type of joy and recreation as I had come to love as a young boy. After a short career in the Coast Guard, I started my charter business, and professional fishing career. During this time, X I have found that showing others how and where to catch fish is very rewarding. I fish most of the local tournaments for Cobia, Red Fish and Spanish Mackerel, and I am currently fishing the Carolina Red Fish Series. I also hold monthly seminars for local tackle shops and fishing clubs, as well as doing all seminars for West Marine stores within traveling distance. I travel with the (www.ncboatshows.com) circuit every winter as a featured seminar speaker, which includes several in NC and VA. I also attend the Big Rock Sports buyers show each year working for Star fishing Tackle, Sea Striker and Calcutta gear, EGO Nets, Cajun Thunder, mirrOlure and any other companies I'm am affiliated with. I attend the ICAST (International Convention of Allied SportFishing Trades) show held in Orlando Fla. doing interviews for new products coming out for my sponsors as well as working in their booths helping buyers choose the right products. I also teach classes in several area fishing schools including the Fishermans Post Fishing schools in eastern NC and the Get Hooked Fishing school hosted by the NC aquariums and the up coming inshore Fishing Institute. I am regularly featured in the NC Sportsman Magazine several times a year. I currently write monthly articles for the Coastal Angler Magazine for the Harkers Island/Cape Lookout area of NC. I currently do several on line radio talk shows for PointClickFish.com during the year as well as online fishing shows for them.. I'm a regular feature on Coastal Carolina Fisherman e- Magazine doing webinars and fishing forecasts featuring tactics as well as new products for fisherman to try out. I have been the host for Sportfishing Television on a few occasions for Tv shows on the pursuit channel and on line. For all those that support me in my fishing career I will always promote your products and/ or services in all my Fishing adventures, travels, magazine articles, fishing schools and seminars in the most professional way possible.